A senior Iranian official's pointed public criticism of the regime's mistreatment of a U.S. permanent resident imprisoned in Iran for three years is offering a glimmer of hope for his family and advocates of all western prisoners held in Iran after years of despair and stalled negotiations. 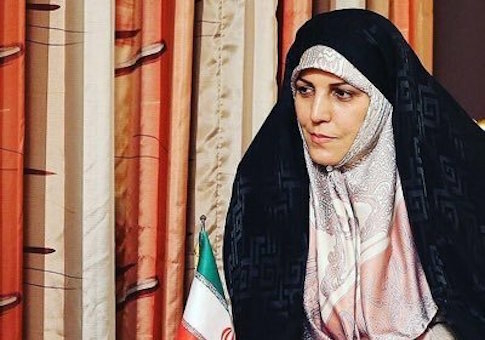 Shahindokht Molaverdi, an outspoken senior adviser on human rights to Iranian President Rouhani, late last week for the first time said the Iranian government had "failed" to help Nizar Zakka, a Lebanese-born internet-freedom advocate who she had invited to a government-sponsored summit. After participating in the summit and posing for photos with Molaverdi and several other Iranian officials, Zakka was captured on his way to the airport to fly back to the United States by the Islamic Revolutionary Guard Corps on Sept. 18, 2015, and jailed, according to his attorney and Molaverdi. He was later charged with spying for the U.S. government and sentenced to 10 years in Iran's notorious Evin prison. "This is in no way approved by the government," Molaverdi told the Associated Press in a wide-ranging interview published on Friday. "We did all we could to stop this from happening, but we are seeing that we have failed to make a significant impact." Zakka, who has lived in the United States for decades, is one of 15 publicly known prisoners with strong western ties unjustly imprisoned in Iran, according to Amnesty International. The Washington Free Beacon first reported that Molaverdi had invited Zakka to the government-sponsored summit and the exact timing and details of his imprisonment in September 2015. Zakka was arrested and imprisoned a day after delivering a presentation on information communication technology for "women empowerment" at the conference, a presentation designed to help women become more active within their communities. Molaverdi has requested the presentation and approved it, according to Zakka's attorney, Jason Poblete. Zakka has gone on six hunger strikes and last year issued a desperate plea for his release in an audio recording, asserting his innocence on the spying charges. Poblete said Zakka's health is in sharp decline and he continues to refuse to sign a confession to the spying charges despite repeated demands by his prison guards to do so. The willingness of an Iranian official to publicly challenge the government's actions surprised some U.S. human rights activists who said such internal public dissension on the treatment of an American prisoner is virtually unprecedented. The comments spurred a new round of speculation—and a degree of hope for families and advocates of western prisoners held in Iran—that Iran's economic turmoil and ongoing nationwide protests over the regime's brutal and oppressive policies is starting to give moderates more leverage against the regime hardliners. "It's a huge risk to criticize the judiciary like that—I have to admire her for doing it. It's encouraging," Elise Auerbach, an Iran country specialist for Amnesty International USA, told the Washington Free Beacon. "Rouhani himself, left to his own devices, I think would not choose to be imprisoning all these prisoners of conscience … but he doesn't have any real control on what the security agencies do." Molaverdi has a history of speaking out on controversial subjects, including women's rights. She has condemned police actions against women loosely wearing their mandatory headscarves and has pushed for access for women to sporting events. Poblete, Zakka's U.S.-based attorney, called Molaverdi's remarks a "welcome sign" and an acknowledgement that his client was falsely accused. Still, more direct action is needed to secure his release, he said. "Nizar was in your country as a guest. You extended a personal invitation, signed by you. Nizar responded to your letter with the information you requested. As Nizar has said before, Nizar was kidnapped and thrown in jail, not treated like a guest," he said in a statement. "You have not visited him or called him. This injustice has caused great and some unspeakable stresses on Nizar and his family." "There are humanitarian and other grounds for Nizar's release, and all parties of interest—they know who they are—need to work expeditiously to right this injustice," he urged. Others who closely monitor Iran's human rights record stress that the Rouhani government is complicit in the unjust imprisonment of Americans and other western citizens and argue that the international community should hold them far more accountable for these violations of international law. Tzvi Kahn, a senior Iran analyst with the Foundation for Defense of Democracy, a foreign-policy think tank, says the IRGC, which imprisoned Zakka, and routinely collaborates with the Rouhani administration, as well as intelligence ministry and police that report directly to Rouhani, to "suppress protests and any kind of dissent within the government." "Overall, [Molaverdi's] critique rings rather hollow because the government itself is complicit in this hostage-taking," Kahn said. "It's important to remember that even though there are often turf wars and disagreements in the [Iranian] government, for the most part, they cooperate in fueling repressions and suppressing protests and in the capturing of dual nationals." Kahn also brushed aside suggestions that Molaverdi's comments could help further efforts Zakka's and other western prisoners' release and blamed the Obama administration's early 2016 prisoner swap and payment of $1.7 billion to Tehran for encouraging Iran to continue taking American hostages and demanding payments or other exchanges for their release in violation of international law. "Overwhelmingly, the regime wants to keep these people in prison to use them as bargaining chips with U.S. and the West," he said. "They have done it in the past successfully, but I don't think the Trump administration would negotiate a similar release." Kahn credits the Trump administration's decision to scrap President Obama's nuclear deal with Iran and new rounds of U.S. sanctions with fueling a pressure campaign that could "play a role for some Iranians to push back a little." Top officials in the Trump administration and several key members of Congress have made the imprisonment of dual nationals a sticking point to the United States reopening the nuclear negotiations, Kahn noted. Pompeo included the release of dual nationals in 12 broad conditions he laid out in a May 21 speech that Tehran must meet in any new nuclear treaty, along with providing international inspectors with unqualified access to all nuclear sites in the country, ending its proliferation of ballistic missiles and further launches of nuclear-capable missile systems, and its support for Middle East terrorist groups, including Hezbollah, Hamas, and Islamic Jihad.